The AP's disharmony with bloggers may have only just begun, as the alternative it's now offering to being served with takedown notices involves paying an up-front sum for excerpting online articles -- as few as five words. A meeting between the Associated Press' Vice President for Strategic Planning Jim Kennedy and Robert Cox, who heads the Media Bloggers Association, is now planned for Thursday of this week. The subject at hand is the AP's attempt to find a new way of sharing AP content, which now involves a fee per excerpt based on its word length. On the heels of a blogosphere revolt last week because of its harsh actions against social news site The Drudge Retort, the AP regrouped over the weekend to take a less litigative -- but more bureaucratic -- approach to dealing with those who wish to quote its material. Where the group had previously invoked the Digital Millennium Copyright Act and sent cease-and-desist orders to at least one blogger, seeking the removal of excerpted content (in some cases as few as 17 words in length), now the press service has attached an "Excerpt for Web Use" charge for passages as short as five words in length. 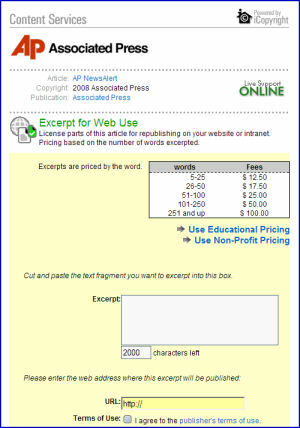 The pricing scale for excerpting AP content begins at $12.50 for 5-25 words and goes as high as $100 for 251 words and up. Nonprofit organizations and educational institutions enjoy a discounted rate. This scale is likely only a temporary solution, as it raises a truckload of questions. For instance: Suppose a news source holds a press conference, and makes a statement to several attendees including an AP correspondent. Does the citation of that quote count as an excerpt of an AP story? What if Reuters cited the same quote? Or worse, what if Reuters cited the quote differently, and a blogger noticed the difference and excerpted both for comparison? If the AP citation turned out to be in error, would the blogger still owe? Also, should "boilerplate" words count towards the fee? For example, a phrase common among news stories is "[Name] had this to say:" for prefacing a published statement or quote. If the AP runs a story with this phrase, will it therefore cost anyone else $12.50 to use this 10 cent expression? How about one more: It's an unspoken fact that subscribers to the AP publish stories that use the AP's facts and that give the AP credit, though which are rewritten by their own staff on-hand, sometimes for length. If a blogger cites a rewritten but credited AP piece, whom does he owe, the AP or the newspaper or online service that rewrote the AP? The Associated Press' Web Use excerpt system is powered by the ubiquitous iCopyright, whose own name ironically smacks of another popular trademark. BetaNews has been checking the link to the iCopyright service today, and has noted it's been down periodically. In its "do's and don'ts" list, iCopyright warns would-be copyright infringers by saying, "Don't buy the 'I am using it for the public good' argument. That is a weak justification for infringement and sends the wrong message to students and employees."